Self-taught designer Tom Givone continues his practice of updating 19th-century farmhouses with unexpected details and salvaged materials with his latest creation—a torqued-volume addition to an 1850s family homestead in Pennsylvania. 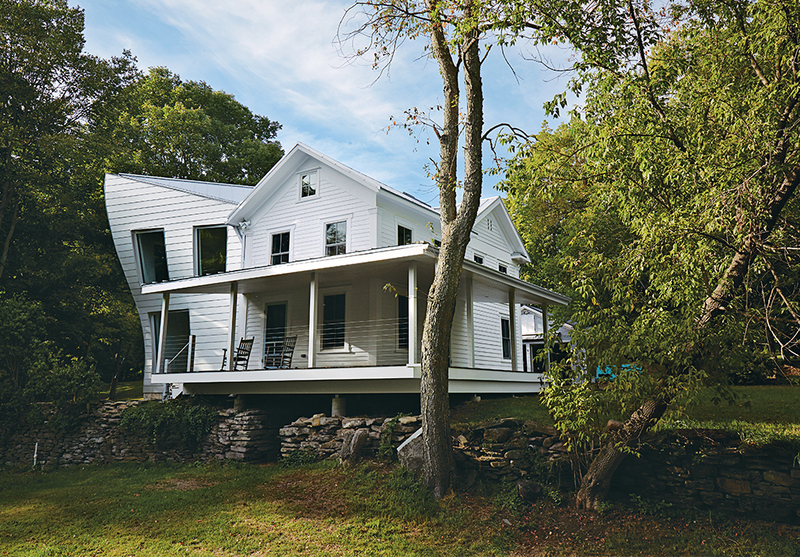 Givone calls this project a companion to his Floating Farmhouse, featured in Dwell in 2012. A suspended balcony on the second floor lets light pass easily through the house. Chicago Metal Rolled Products, a company that specializes in roller coaster track, fabricated the addition’s columns using a technique called “round tube bending”— a cold process by which straight 8-foot-long hollow tubes are pushed through a series of dies and rollers to bend them into a desired shape. "You sketch a concept, model it, but to see it actually take shape is always surprising." Givone says. "Building this specific structure, that payoff was more dramatic. It looked just as I had imagined and rendered it, by hand in Play-Doh, all those months before." Construction took 16 months from start to finish. The new custom kitchen is situated in the original structure. The window is a new commercial unit with an operable frameless center pane and was set so that the countertop could tuck right underneath it to create a 1/4-inch shadow line. Givone sourced a slab of marble for the sink and countertop from Thompson Stone in Montague, New Jersey. The updated kitchen is outfitted with stainless steel appliances, including a Bosch range, a Fisher & Paykel refrigerator, and a Frigidaire range hood. The faucet is Hudson Reed. The client requested a porch, so Givone built one with columns made of anodized aluminum, the same material used in the siding of the addition, and stainless steel cables. "Even though it's a traditional, covered porch, it has very modern materials," he says. A sitting area outside the master bedroom overlooks the dining room. Kartell’s 4801 chair occupies a corner of the master bedroom. All of the home's wide-plank floors were reclaimed from the original farmhouse during the demolition process. The bathroom features a salvaged 1920s schoolhouse sink from Olde Good Things. The faucet mixers are by Jado; the original single tap openings were enlarged to fit them, and the entire sink was re-glazed. A glass-lined shower with a Hudson Reed showerhead adds a modern touch to the second-floor bathroom. A pane of privacy glass lets natural light enter the room. In the existing house, the wood beams were hidden under sheetrock and wallpaper. "I exposed them all, but I didn't let that dictate where the new walls would go," Givone says. "I let the beams fall where they may." The new dining area is surrounded by swathes of glass. The windows were pivoted and installed at unusual angles in order to accommodate the undulating walls of the addition. The kitchen, dining room, and living room are connected in an open-plan arrangement. A bright, modern living area opens onto the porch. The modern staircase was built with the same salvaged wall planks that are used as flooring throughout. Givone: Their only directives to me were open space and lots of light. The house was a lot like other similarly aged homes that had been updated over the years—the 70s called and wants its linoleum back. But I knew that the good stuff, like the original wide plank floors and hand-hewn beams, was lurking beneath all those layers. So the first design impetus was to bring the original house back. The second was to turn it on its ear. My client grew up with her seven siblings in the old farmhouse right across the street. Her brother still lives there, and like the creek that runs through both properties, family flows freely back and forth. I imagined this bond as a physical force, like a gravitational field between the two homes, acting on the addition and “pulling” it toward the original farmhouse across the street. This was how I arrived at the volume’s shape—it’s a sculptural expression of family connection. Twisting it opened up new sightlines, allowing my client to view her childhood home and the surrounding fields as the structure “nods” toward those areas. Givone: This project posed immense challenges, not least of which was finding the resources to build such an unusual, complex form; tough under any circumstances, but in a rural farming community…who was I kidding? To that end, I tapped local architects Joe Rominski and Rick Hammer of JRA Architects in Scranton, Pennsylvania. They modeled and designed the five curving columns that form the skeleton of the new addition and make its undulating walls possible. The architects also sourced a steel company in Chicago, specializing in roller coaster track, to fabricate the columns. From there, it was about assembling a team that welcomed the twin challenges of meticulous restoration work and cutting-edge construction (they were not to be disappointed). What surprised me most about the project was my clients' willingness to go all in with me on this unusual vision for their home; a total leap of faith. When we met, I assumed a traditional renovation would be their only interest. To be granted that level of trust was a very humbling experience. What's next for me is putting the finishing touches on my own home, a small Victorian row house in Harlem. I also have another historic farm-house renovation in the Catskills, which is presently in the design phase.